A lifelong horsewoman with a B.S. in Equestrian Studies from William Woods College, Chris has 40 years of experience in the horse world. Growing up showing hunters and jumpers, she also competed in Three Day Events, Dressage, long distance competitive trail riding and operated a Standardbred mare care operation in her home state of Illinois. She and her husband moved to Oregon in 2013. Recently retired in January 2018 from her role as Executive Director of a statewide non-profit advocacy organization, she has turned her attention full time to Equus Coaching®. 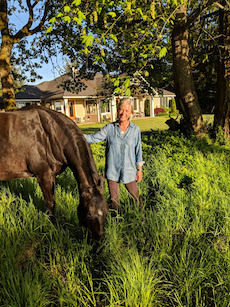 With the assistance of her herd of three horses and based out of her home in the foothills of the Cascades, she is offering individual and small group Equus Coaching® sessions to bring the healing power of horses to those interested in tapping into their truth through the heart of a horse.